For machine setup, you can use the direction keys of the machine operating panel to move the machine axes manually or in incremental jog. 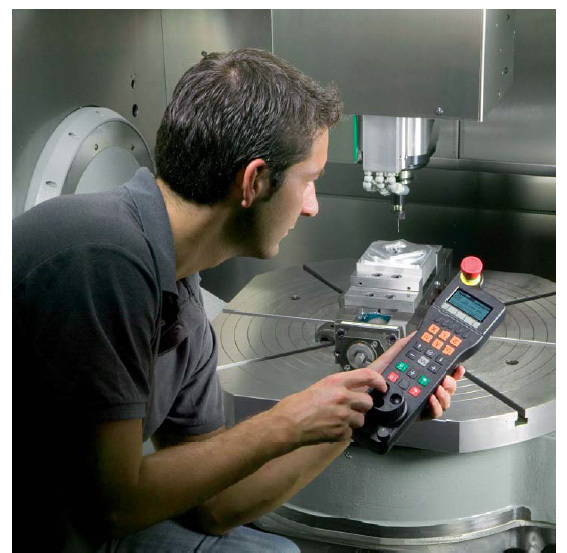 A simpler and more reliable way, however, is to use the electronic handwheels from HEIDENHAIN. With the portable handwheels you are always close to the action, enjoy a close-up view of the setup process, and can control the infeed responsively and precisely. The HR 550 FS with wireless transmission is exceedingly simple to use - because it communicates with the handwheel holder via radio transmission, your movements are not restricted in any manner, and you can fully concentrate on the action in the machine’s working space. The practical HRA 551 handwheel holder is not just a docking station for the handwheel, it also features an integrated charger for the handwheel’s battery, so that your HR 550 FS is always ready for the next job. The HR 550 FS electronic handwheel from HEIDENHAIN is available with and without mechanical detent, with 100 stops per revolution. The traverse path per stop can be set via parameters.